This program was recorded on Tuesday, October 21, 2008, at the Clarion Hotel and Conference Center in Cherry Hill, NJ. 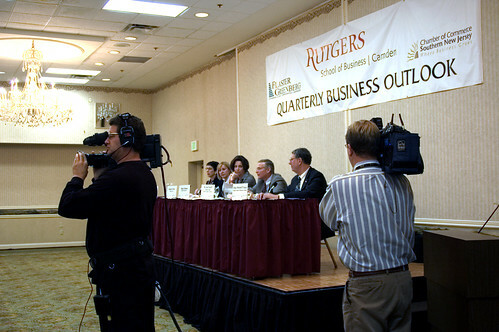 Cherry Hill, New Jersey, USA – Tuesday October 21, 2008: Rutgers Quarterly Business Outlook panel discusses the economy while videographers from Comcast Cable TV and New Jersey Network photograph the program. Panelists were (from left): Caren Franzini, CEO of the New Jersey Economic Development Authority; Susanne Svizeny, regional president, wholesale banking, Wachovia Corp.; Mindy Holman, President and CEO of Holman Enterprises; Joel Naroff, chief economist of TD Commerce Bank; and Dean Mitchell P. Koza of Rutgers, who moderated the program. About 300 people attended the panel presentation.